Brian Callow, Ronny Waters, Bob Burtenshaw, Guitar Mick, Mad Phil, sausage rolls from Lou's cafe next door, Giutar and chess lessons. A 2 pence piece taped to the arm on the record player. Brian's mk3 Cortina. Les Bawcutt, the governor from the Dulwich shop on his moped. Stray, led Zep, ACDC, dire straits, any guitar based music. Such memories! Comment: Ted Lismore. 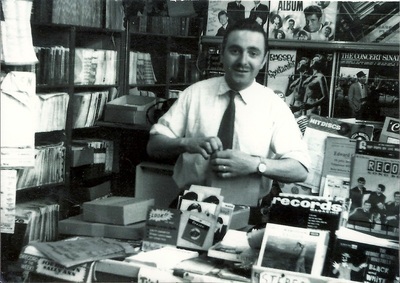 Anyone remember BRIAN HAWKINS at Lordship Lane and later as manager of Deptford High Street branch? David Rose. (Sept 13, 2014) Curator said:Denise your email does not work as I tried to contact you. (July 3, 2014) Jeremy Hine said:Wow that paper bag brings back memories. 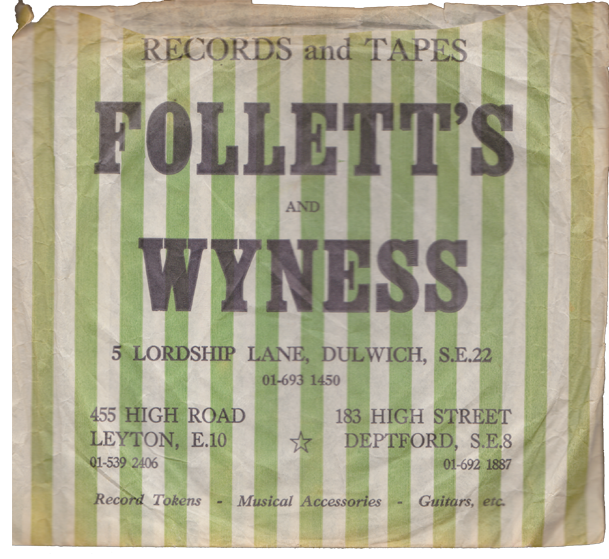 I used to love popping into Follett's in Lordship Lane. 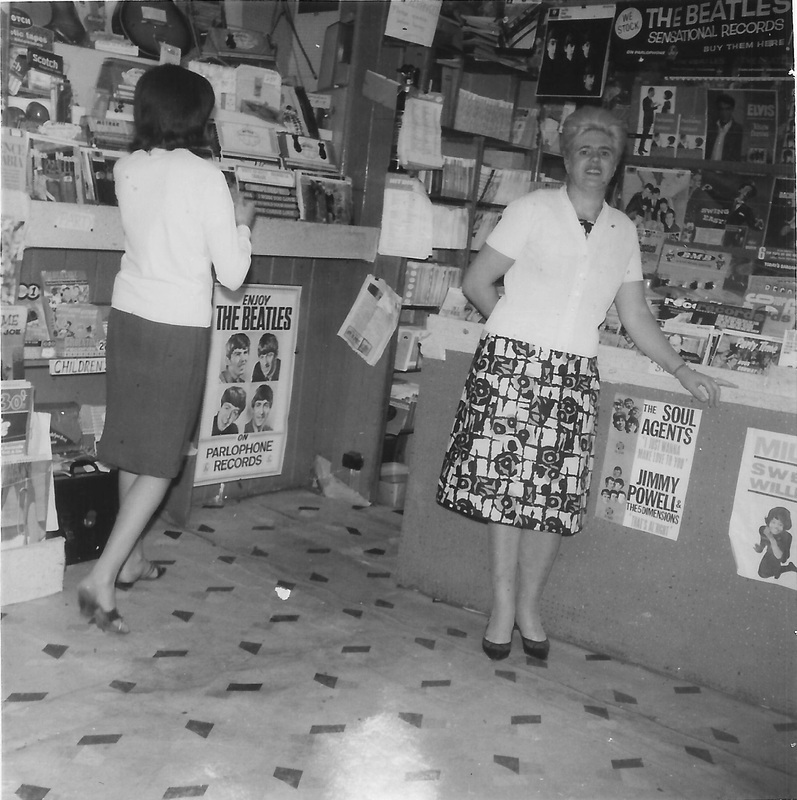 Up 2 or 3 steps to the vinyl selection. I even remember the very first record I bought there though sadly not one you'd boast about. It was Stephen Smith and Father, a 7ish year old boy on drums & his dad who had won Opportunity Knocks. I wanted to be that boy! I remember picking it up and having the biggest grin. I mainly remember the lady in the shop though can't think of her name. (May 23, 2014) Ted lismore said:His name was Brian Callow. (Mar 26, 2014) Anonymous said:Message for David Rose. Yes I have complete update on Brian Hawkins, my first Husband.i also have photos of the shop and remember well our evenings with Gail,Tim and Kim and the music rehearsals in Stratford. Good times.Still have the first photo you took of my son Kevin who is now a Musician with royal ballet(principle percussionist) and also with The Royal Philharmonic Orchestra. Hope to hear from you.Best wishes Denise. (Mar 24, 2014) Anonymous said:I am Denise Hawkins, Brian's first wife and have much information onBrianifyouneedit. Myers-mail address is Denise. Vennard@sky . Com. I remember David Rose and Familywell. (June 20, 2013) Lee Kluth said:What a wonderful place this was. Brian would order anything for you if he didn't have it in stock.